b) Baffle the hell out of me. c) Move me to (manly) tears. In the space of about 3 minutes. 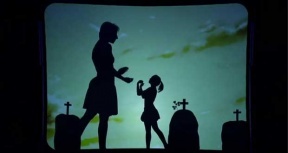 But then again, I've never come across the shadow theatre before. Comprised primarily of best-in-class performers and dancers from varied backgrounds such as acrobatics, dance, kung-fu, ballet, juggling and rhythmic gymnastics, this Japanese group describes what they do as "motion graphics performing arts". They combine ambient music, dance, and beautiful lighting and visual effects to convey emotion and wonder in a unique and pleasant way. Choreographer David Middendorp is the mastermind behind "Blue Journey", a dancing duo that describe what they do as a "multimedia dance experience". With the use of silhouettes on a canvas behind the dancers, the group manages to tell stories and convey emotion using the combination of music, dance and shadows. They were also featured in the 2014 edition of "America's got Talent", where they never failed to dazzle the audience and judges.